PCLTool SDK is a collection of tools for converting PCL into a variety of formats BMP, EMF (RAW), JPG, PCX, PDF Raster, PDF Vector, PMF, PNG, PWG, PCLm, TIF, WMF, and XPS. PCLTool is unique in that it uses its own internal font engine to rasterize fonts ‘on-the-fly’ creating either bitmap files (PNG, TIF) at various resolutions or vector files (EMF, PDF) with TrueType fonts to match those resident fonts in Windows and in HP LaserJet Series IV. PCLTool SDK includes a sample application (PCLTool.exe) that exercises all of the functions of both DLLs that are used in most custom solutions. PTC32.dll does the conversion from the source PCL file into the target file format and creates a placeable and device-independent file. PTV32.dll can preview the converted file on the screen or it can print it to the current Windows printer driver. Most PCL transformation products are actually legacy parsers that can only extract text from simple PCL. PCLTool SDK can transform complex PCL generated from today’s printer drivers. PCLTool has a new text extraction method that can unscramble Chinese and other double-byte print streams back into legible Unicode or UTF-8 text. We recently ported PCLTool SDK to Red Hat Linux! HP chose our Linux version because we have the only product that can convert the complex PCL5e generated by the State of California’s CalWin system for its multilingual citizenry. PCLTool SDK is capable of supporting all the characters included in the Unicode specification for Chinese, Japanese, Korean, Cambodian, Thai, Farsi and others. 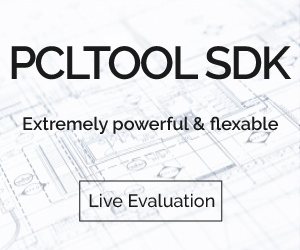 PCLTool SDK is available in five powerful configurations. Each option is designed to give developers the flexibility to choose the tools they need based on the composition of their PCL and application requirements. Each option comes standard with processing up to 50,000 pages per 30-day interval. Extensive Usage Licensing Options are available for applications that require support for high-volume PCL conversion, transformation for third parties, and other applications that require a greater degree of support or where our product is used as part of a service. Our Dynamic link library (.DLL) converts PCL to all supported formats to easily integrate into any custom application workflows. Option I includes our PCLMagic printer driver, port monitor, and folder-watching HotDir programs. Option I is recommended for application requirements that cannot be met with either Option III or Option V.
Up to 100 Client Workstation Units or one server-based unit used in a Controlled Source Application for Viewing or Printing ONLY. No conversions to other formats, text extraction, indexing or printing to file through FAX, PDF or other printer drivers permitted. Use PCLXForm with a standard script and command line overrides to convert PCL to PDF, PDF/A, XPS, and ASCII text. Option III includes our PCLMagic printer driver, port monitor, and folder-watching HotDir programs. Use PCLXForm with a standard script and command line overrides to convert PCL to all supported formats except PCL to PDF. Use PCLXForm to convert complex PCL (and, PCLm/PCLmS and PWG cloud printing formats) into all supported file formats plus ASCII text. This is our most powerful SDK option. PCLXForm is a Windows console program with a powerful script programming language, command line overrides and runtime includes command files. Option V includes our PCLMagic printer driver, port monitor, and folder-watching HotDir programs, which provide powerful functions. Use PCLXForm for transformations of all supported formats. Unlimited custom PCLXForm (.TPT) scripts for printstream editing, transformation, and indexing applications developed by Licensee. Licensee can write scripts to work with unlimited print streams. No Keycodes are required for .tpt scripts. PCL software applications are not an out-of-the-box solution, so we strongly encourage everyone to give us a call at (+1) 858 732-1424 and tell us your application workflow. We will get you into the correct solution, saving you time and money! Our staff of engineers and management have over 25 years of continuous experience in the development of PCL conversion solutions, printer drivers, font technology, and other imaging-related solutions.